General Tso’s chicken, is, apparently, one of the most popular Chinese takeout dishes in the US, consistently making the number one spot in many polls and reports, like this one done by NBC News. 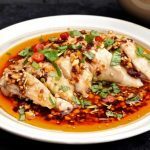 It is a delicious combination of lightly battered chicken in a sweet and tangy sauce laced with chilli. Purportedly named after General Zuo Zongtang, a 19th century Chinese general, General Tso’s chicken is said to be from Hunan in China. You will, however, be hard pressed to actually find this dish in Hunan, or any proof that it was named after said general. For one thing, folks in Hunan will tell you that it is too sweet, and nothing like the dry and spicy dishes of the Hunan province. 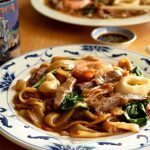 According to Fuchsia Dunlop, in her The Revolutionary Chinese Cookbook , the dish was created by Peng Chang-kuei, a Chinese chef, who fled to Taiwan after the civil war, then to New York in 1973. Peng’s original Hunanese General Tso’s chicken was nothing like what it is today; it was hot, sour and salty. Recognising the need to cater to his American customers, Peng altered the recipe by sweetening it and cutting back on the chilli. 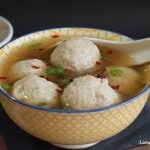 This became such a huge hit that it has long been an American favourite and is widely regraded to be an American Chinese recipe, much like Egg Rolls. How can it not be, when Henry Kissinger was supposed to have been a big fan? There is a certain irony linked to the General Tso’s chicken legend. As a nod to perhaps Peng’s Hunanese roots, Chinese chefs have, for a decade or so now, started to include this dish as part of Hunanese cuisine, even if it doesn’t, in any way, resemble Hunanese flavours. 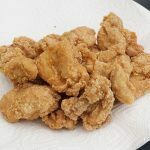 Here, I’m sharing with you, my recipe for General Tso’s chicken, the way I teach it in my classes. 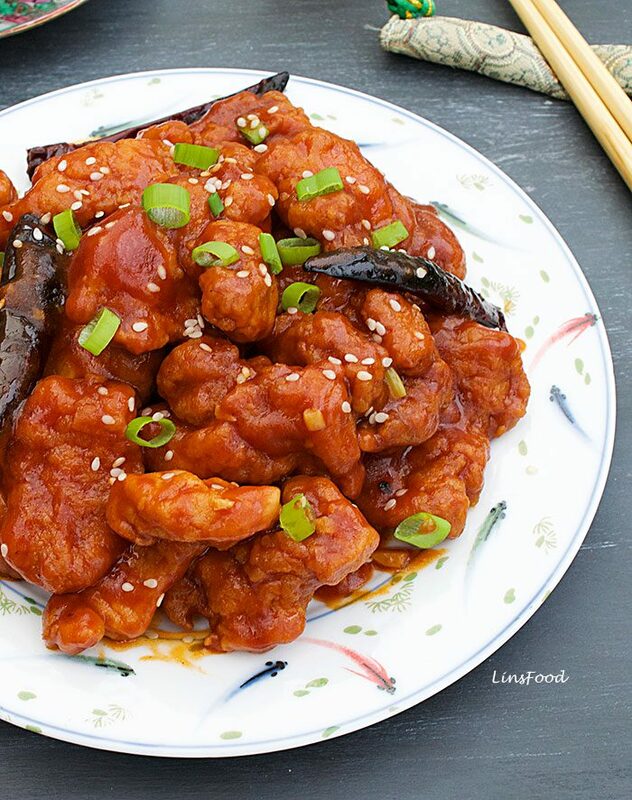 How to Cook General Tso’s Chicken? Sounds easy when broken up in steps, doesn’t it? The whole process is pretty straightforward. 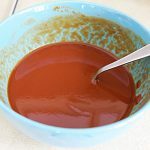 When you’ve made it once, you can play around with the sauce to your heart’s content, to make it spicier, more or less sweet and increase or decrease the tang. 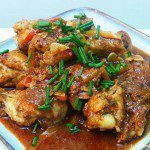 While we all go for chicken breast because it is a leaner meat and quick to cook, chicken thighs are your better option here. Let’s face it, with that frying, this is no diet food. So go with thigh meat, as it is more flavoursome and doesn’t dry out with the 3-minute of frying. Chicken thigh meat, off the bone, cut in bite size pieces, is very quick to cook. I love adding a little bit of vodka when making batter or pastry. It increases the amount of liquid in your batter/pastry, without making it too tough as part of that liquid is alcohol, which will cook off to some extent. The result is a lighter batter/pastry. But that’s a matter of preference, and I’ve listed the alcohol as optional. Egg white in the marinade allows the dry coat to cling better and also adds to the crunch. However, as my girls, are allergic to eggs, I always do a separate portion of eggless General Tso’s Chicken by omitting it in the wet marinade. It’s still delicious. 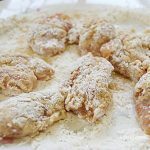 It does create a lighter batter, but in my opinion, not necessary because that lightness is completely lost once that batter takes on the sauce. Kind of also the reason why you can skip the alcohol in the wet marinade too! We use 2 types of soy sauces in this recipe: light and dark. 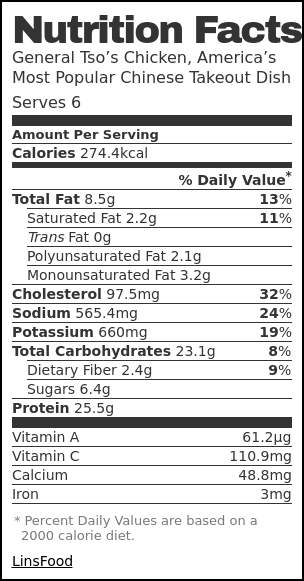 To read up more on soy sauces and the different varieties, go to the page on Soy Sauce. 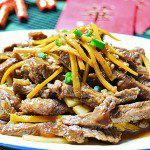 It contains ingredients to create a sweet and sour sauce, with a hint of heat. When I cook sweet and sour dishes, I always add some tomato ketchup to it. It’s a trick I learnt from my mum as well as my grandma. My granny used to also add some tomato ketchup to curries as a flavour enhancer, a trick I’ve copied. So you’ll find tomato ketchup in the sauce for this recipe. Together with the vinegar, you get an amazing level of tang. 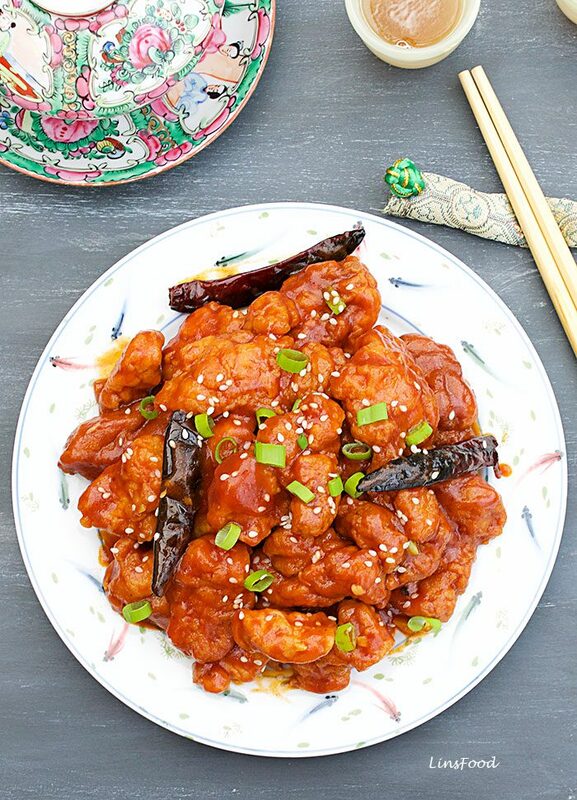 Are you a fan of Chinese food, and especially General Tso’s chicken? General Tso's Chicken, with its battered chicken in a sweet and sour sauce, laced with chilli, is apparently, America's favourite Chinese takeout dish. Cut the chicken thighs into bitesize pieces. Place all the marinade ingredients into a bowl and add the chicken. Coat the chicken pieces thoroughly and leave to marinade for 20 minutes. Chop up the garlic and ginger finely. You could also grate the ginger if you prefer. Slice the spring onions (scallions) in small rings separating the white and green in two bowls. Place the dry coat ingredients onto a flat plate and mix thoroughly. Add all the sauce ingredients in a bowl, whisk with a fork to mix, and set aside. Heat the 250ml (1 cup) of oil in a wok or deep frying pan on high heat until it's hot and just smoking. Lower the heat to medium high (that means about 3/4 of the way). 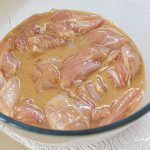 Take the marinated chicken pieces, and dip them into the dry coat one at a time. Shake off excess flour and carefully lower it into the hot oil. Don't drop it in, you might get splashed with the hot oil. Use a spatula to lower the chicken in, if it worries you. Don't overcrowd, fry 5-6 pieces at a time. Cook the chicken for 3 minutes, turning, if not completely covered by the oil. When done, drain on a plate lined with kitchen paper. When all the chicken pieces are cooked, pour out all the oil but 1 tablespoon of it and place back on the stove and lower the heat to medium. Add the chillies, garlic, ginger and white spring onions (scallions) and fry for 30 seconds. Stir the sauce that you had set aside earlier with a spoon, as the cornflour would have settled to the bottom. Now add this sauce to the wok and bring to a boil, stirring as it thickens (because of the cornflour). Add the chicken pieces and stir for 30 seconds, still on medium heat, and coat the chicken pieces thoroughly. Take off the heat and stir in the sesame oil. Dish out onto a warm plate and scatter the green spring onion (scallions) slices and sesame seeds all over and serve immediately. This is fantastic! Bookmarked for Sunday! Thanks, how did it go? Yum! This looks delish! This is one of my favorite things to order and now I have a great recipe to make it at home! Lovin’ this takeout dish. Wish my hubbie would cook this for me. Another nice recipe. How do you do it? This is awesome, my favourite Chinese dish! I’ve saved the recipe to make soon. Thanks for breaking down the recipe into steps. Very helpful! Thank you Bethany, I hope you enjoy it. Thank you very much for this recipe. It is my favourite takeout dish, and I am planning to make it this weekend. Have printed the recipe and stuck it on the board in the kitchen! Awesome. Looking forward to the feedback.